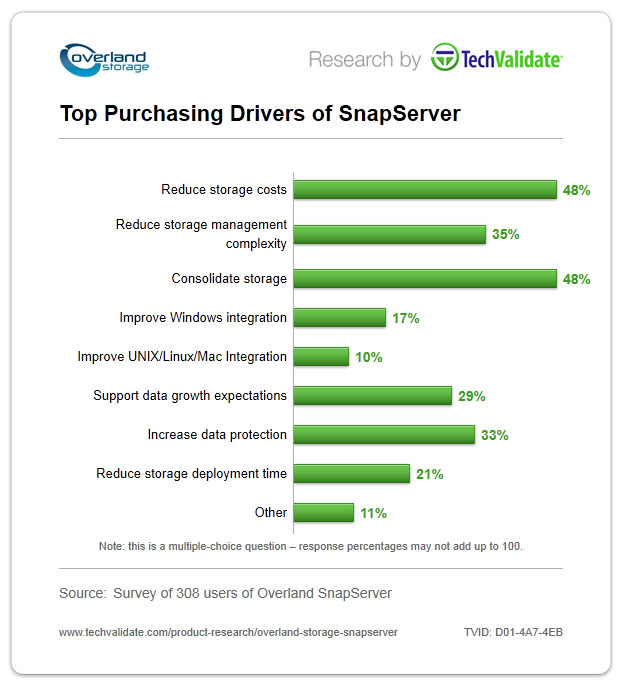 Assessment of top purchasing drivers of SnapServer NAS, such as reduction of storage costs, reduction of management complexity, consolidation, integration, data growth, data protection and storage deployment time. This chart is based on real-world experiences shared by verified users of Overland SnapServer. TechValidate verifies the identity and organizational affiliation of all participants that contribute to published research data, while guaranteeing their anonymity so that they may share information honestly and freely. The research data displayed here represents a subset of all data collected. The data presented here was sourced directly from verified users of Overland SnapServer by TechValidate. We verify the identity and organizational affiliation of all research participants while guaranteeing anonymity so that people can speak freely.